Q3 earnings season is in full swing, driving much of the movement in stocks. According to FactSet, 76% of S&P 500 companies reporting so far have beaten analyst earnings expectations. That’s better than the 5-year average of 69%. Technology stocks led the US market higher, gaining 7.8% on a slew of positive reports. Telecom and consumer staples stocks lagged, falling 4.1% and 7.6% respectively. Speculation earlier in the month surrounding the appointment of an inflation hawk to lead the Fed helped the dollar regain ground against major currencies. Interest rates rose in response as well, pushing the 10-year yield back-up briefly above 2.4%, the highest level since March. The dollar and the bond market retraced some of these moves as Jerome Powell, President Trump’s apparent choice, is believed to have views similar to current chair Janet Yellen. Investors are focused on the new tax reform proposal released this week. Despite what some have said, tax reform will be no easier than healthcare. The trick will be threading the needle between those wanting lower tax rates and those resistant to adding to the deficit. In our opinion, a failure on tax reform is not enough to cause a stock market crash. Most major market declines are in anticipation of a slowdown in economic growth. Right now, all major economies – North America, Europe, and Asia – have shown signs of a unified global expansion despite the political uncertainty over the last few years. Policy failures are more likely to create short-term volatility than prolonged downturns in the market. Big tech came in with big beats last week. Microsoft announced their cloud computing segment generated revenue faster than expected. Alphabet (Google’s parent company) reported strong ad revenue, and Amazon beat analysts’ expectations on earnings and revenue. Big tech is getting bigger, but this won’t go on forever. As these firms gain more clout and possess and exploit growing amounts of personal (and formerly private) information, their power and influence will become increasingly challenged. European courts have already brought lawsuits against Alphabet for their clout in web search. Amazon wants access to your home, and Facebook is implicated in the spreading of Russian propaganda during the 2016 election. Shares in some of these companies, namely Google, Apple, and Amazon, are increasingly dependent on future results to continue their extended runs. While this market leadership can go on for longer than many expect, history suggests that stocks, driven by good stories of future growth, usually see a reversion to the mean. Either expectations get too far ahead, competitive disruption erodes their market share, or governments simply break them up. Whatever may be the case, the challenge for investors always remains: do I continue to own shares in these companies, understanding that the good times won’t last forever? There isn’t a single right answer, but we believe our core-satellite approach helps control the risk in these situations. An indexed core will continue to benefit from whichever firms lead the stock market higher tomorrow, and a satellite strategy can put speed brakes on company-specific risks. The satellite strategy will under or out-perform in any given period but can also mitigate the impact of large stocks driving the indexes lower. A perfect solution does not exist, but balancing the risk of large stocks on your portfolio helps. This final segment in our series discusses a structured approach for putting the various investment elements together to build a global, risk-balanced portfolio. The benefits of establishing this portfolio are clear: it lowers costs, diversifies company specific risks, and is more tax efficient. Our focus is on a core-satellite approach to portfolio construction, a method used to combine a relatively stable core portfolio with a more actively managed satellite component. The appeal of core-satellite investing is that it combines the benefits of indexing – broad diversification, lower cost, and tax-efficiency – with the potential for out-performance and improved risk control. The core-satellite approach divides the portfolio into a core component, generally managed using index funds designed to offer the broad exposure to traditional assets, and strategies that attempt to add unique sources of return through security selection, exposure to non-core assets, or by adding tactical overlays for risk control. It is best described by discussing both what it achieves and what it avoids. Core-satellite reduces costs. Many expensive funds provide the same asset class exposure of an index fund wrapped in an expensive fee. Deconstructing the portfolio reduces the costs for the similar exposure. Over time, these cost savings can accumulate into significantly more wealth. The indexed component, or core, provides broader, more consistent diversification than is possible with a 100% actively managed portfolio. By definition, a broad market index contains all the stocks in an asset or sub-asset class owned in proportion to the market values, providing instant diversification and risk control. In recent years, many new “smart-beta” strategies have been marketed as better than market value weighted portfolios. While these products may be useful in satellite strategies, they are actually active management in indexed clothing. Core-satellite improves discipline and stability by reducing reliance on picking winners or chasing returns. All investors intuitively want to win the game and hit the next home run – find the next “ten bagger”[ii] in stock picking parlance, but these stocks inevitably introduce a lot of risk as well. A core-satellite system can allow for riskier bets, but in a predetermined, risk-controlled way. Core-satellite reduces management and transaction costs and improves tax efficiency. Active trading of stocks and bonds is expensive and results in higher tax bills. Alternatively, holding some individual securities creates opportunities for tax-loss harvesting. Limiting the active component to a predetermined percentage holds down costs. Core-satellite provides a controlled, structured framework for using alternative investment strategies. The core-satellite process is not limited to index versus active investing, but can also help manage riskier asset classes, such as commodities, real estate or high-yield bonds. 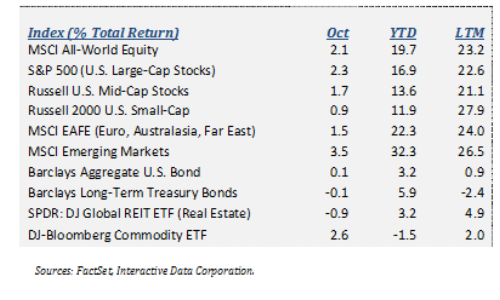 Markets continue to exceed most expectations this year with a few large stocks driving returns. In our experience, it’s best to be agnostic to past results, however better or worse than expected. Focusing on taking prudent risks and acknowledging no one has a crystal ball are keys to long-term investing success. We believe our philosophy and portfolio construction offer a customized framework to fit most needs for generating a successful investment strategy. DISCLOSURES: The information provided in this letter is for general informational purposes only and should not be considered an individualized recommendation of any particular security, strategy or investment product, and should not be construed as investment, legal or tax advice. Proffitt & Goodson, Inc. makes no warranties with regard to the information or results obtained by third parties and its use and disclaim any liability arising out of, or reliance on the information. The information is subject to change and, although based on information that Proffitt & Goodson, Inc. considers reliable, it is not guaranteed as to accuracy or completeness. Source information is obtained from independent financial data suppliers (Interactive Data Corporation, Morningstar, etc.). The Market Categories illustrated in this Financial Market Summary are indexes of specific equity, fixed income or other categories. An index is a reflection of the underlying securities in a particular selection of securities picked due to a particular type of investment. These indexes account for the reinvestment of dividends and other income, but do not account for any transaction, custody, tax, or management fees encountered in real life. To that extent, these index numbers are artificial and cannot be duplicated in real life due to the necessity of paying those transaction, custody, tax, and management fees. Industry and specific sector returns (technology, utilities, etc.) do not account for the reinvestment of dividends or other income. Future events will cause these historical rates of return to be different in the future with the potential for loss as well as profit. Specific indexes may change their definition of particular security types included over time. These indexes reflect investments for a limited period of time and do not reflect performance in different economic or market cycles and are not intended to reflect the actual outcomes of any client of Proffitt & Goodson, Inc. Past performance does not guarantee future results.